"Lycanthropy: transformation from witch to wolf"
"The Legend of the werewolf is one of the oldest and most primal of man’s superstitions. It shares with the vampire, the witch, the phantom and the warlock a history which reaches thousands of years back in time and which has terrified generation after generation of people in sophisticated cities as well as in the world’s most primitive places" Basil Copper, The Werewolf in Legend, Fact and Art. Based upon an original screenplay by Karen Walton ( THE CITY, HEART:THE MARILYN BELL STORY ) derived from a story by her and John Fawcett, Ginger Snaps is produced by Steve Hoban ( BLOOD & DONUTS, CYBERWORLD ) and Karen Lee Hall (HOUSE, OUR HERO ) and directed by John Fawcett (BOY’S CLUB). 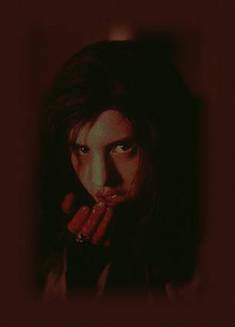 Ginger Snaps stars Emily Perkins ( IT, X-FILES) as Brigitte, a fifteen-year old who is faced with a horrible task to try and save her sister Ginger, played with tremendous fury by Katharine Isabelle (DISTURBING BEHAVIOUR) , from the predatory infection that is threatening to transform her into an unrecognizable monster. Known in the middle ages as ‘a servant of the Devil’ overtaken by blood lust and uncontrollable desire, the werewolf story was believed to be true and many individuals were executed for being werewolves. Taking the myth of the werewolf and translating it into a dark tale of modern adolescence, Ginger Snaps plays upon teen-aged fears and isolation by interpreting the curse of the werewolf as a lethal, biological infection which attacks the blood and can be sexually transmitted. Herself attacked by a wild creature in the woods, Ginger goes on to pass on the ‘disease’ to Jason (Jesse Moss), a popular boy at school who suddenly finds Ginger irresistible. Confused and frightened by the changes happening to her body, Ginger doesn’t want anyone to learn her secret. This leaves her loyal sister, Brigitte, no choice but to try and help with no assistance from anyone other than the loner Sam, played by Kris Lemche (EXISTENZ, KNOCK AROUND GUYS). Ginger and Brigitte’s mother Pamela is played with delicious humour by Mimi Rogers (SOMEONE TO WATCH OVER ME, AUSTIN POWERS, X-FILES ). Rounding out the cast are Peter Keleghan as the hapless guidance cousellor, Danielle Hampton the snotty popular girl who gets more than she bargained for when challenging Ginger, and John Bourgeois who suffers in silence as the only male in his particularly estrogen-soaked family. Ginger survives as her horrible wounds miraculously heal over, but something is not quite right. Ginger is irritable and in denial. But to Brigitte it is obvious that a terrifying force has taken hold of her sister. She's convinced that the hairs growing from Ginger's scars and the tail emerging from the base of her spine can mean only one thing – Ginger is becoming a werewolf. Driven by a mounting, inexplicable blood lust, Ginger transforms from a disdainful outsider into an aggressive young woman on the prowl. Afraid to tell anyone of her suspicions yet desperate to save her sister from the infection which is slowly overtaking her, Brigitte has no where else to turn except to enigmatic bad-boy Sam, the local pot supplier and amateur botanist. Together they search for a way to cure the otherworldly infection coursing through Ginger's veins. Ginger’s slow, horrifying transformation coincides with her battle with her rationality as she alternately pleads for Brigitte's help and jealously accuses her of betrayal. Ginger's savage behaviour escalates. As Brigitte strives to protect Ginger, she becomes complicit in her violent, uncontrollable crimes. "Truly, the situation of the werewolf [is] a most terrible one, a curse. …The lycanthrope…was doomed to wander the night until some creature stronger than himself destroyed him or a silver bullet put an end to his misery. The victim of lycanthropia had little to hope for, either in this world or the next… it was no surprise that the victims sought desperate remedies, ranging from the help of wizards and witches to drastic and occasionally self-inflicted surgery." Basil Copper. In January of 1995 John Fawcett approached screenwriter Karen Walton with a premise for a screenplay. As Fawcett tells it, "I knew that I wanted to make a metamorphosis movie and a horror film. I also knew that I wanted to work with girls. That’s basically how it all started." Walton recalls "John and I talked a lot about working together. We just had to try and find an idea that appealed to us both. Initially, I didn’t want to get involved in writing a horror movie at all. I generally find them very disappointing as stories and pretty predictable and frustrating in terms of the depiction of females." However, conversations with Fawcett led Walton to realize that it was a genre ripe for re-interpretation. "Ginger Snaps presented an opportunity to make something sophisticated - to create real characters with real problems, characters that are human beings whose struggles are based on relationships. [I found the] horror element in the nightmare of trying to figure out who you are and who it is that you love. That was attractive to me, the opportunity to put a twist on the subject matter" explains Walton. "Right from the start we wanted to make a movie that would entertain." Fawcett and Walton approached producer Steve Hoban with the story treatment. Both had worked with Hoban before and he was their first choice for Ginger Snaps. "I was immediately attracted to the prospect of working with John and Karen on a feature film. I thought we had similar sensibilities and would make a great team. We were each at similar stages in our careers and in the Canadian film industry I believe we were perceived as a solid trio that covered all of the necessary bases to successfully pull off what is a fairly ambitious independent film." After Walton completed the first draft of the screenplay the next recruitee was story editor Ken Chubb, who had previously worked with Hoban. "I figured Ken would round out what each of Karen, John and I brought to the story development process," says Hoban. Chubb had years of story editing experience in film, television and theatre. But despite his years experience, he was young-at-heart enough to appreciate the edgy, youth oriented material. "It was a great story right from the beginning." What followed was two more years of script work, which to Chubb, was "the most positive script development process I’ve ever taken part in". Now the team had a script that was suitable to raise production financing. "The script spoke for itself. Anyone who read it responded immediately and viscerally. Everybody recognized the incredible craft of the script - how well written it was and how well drawn the characters were. It’s a unique story. So it wasn’t difficult to sell the script and it wasn’t difficult to sell John. We had a lot of interest that allowed us to raise more money than is typical for a film of this size in Canada. " Steve Hoban, producer. Motion International was the first distributor to commit to the film’s financing. Jim Murphy was a champion of the project from the beginning, seeing it as a commercial yet uniquely Canadian film. With Canada sold, Hoban went after the elusive U.S. market. In April of 1998 it looked as if Ginger Snaps would go into production that fall with Trimark acquiring world rights excluding Canada, which were to be held by Motion, and Hoban decided to bring on producing partner Karen Lee Hall. "In order to make the movie the right way we needed to maximize the financing available from all territories and all media. I was comfortable with my knowledge of the players in the international film world, but was not as familiar with the Canadian television world. Canadian television ended up being a critical component to our financing scenario and Karen, who already knew many of the relevant people, put that together." Says Hoban. Intense negotiations with Trimark ensued, with all parties finagling over the details of Canadian content requirements. An agreement in principal was finally reached in June, but by that point Telefilm Canada – Canada’s federal film funding agency, which had also been a keen supporter of the project for several years – could no longer participate in that fiscal year, its production budget having already been committed by then. The Ginger Snaps team made a decision: rather than go ahead with only 60% financing, they would put off production and wait for Telefilm’s next round. The decision proved to be a dangerous one as Trimark underwent internal changes in the fall of 1998. The film’s champions left the company and Trimark dropped Ginger Snaps. Cast adrift, producers Hoban and Hall began another frantic search for financing. In January 1999 they finally found the financial partners with whom they would go into production. US distribution company Unapix Entertainment had done well with the video rights on BOYS CLUB, Fawcett’s first feature. They loved Ginger Snaps and when Trimark fell out, they jumped on board. In the meantime, Marie-Claude Poulin and Noah Segal had recently joined Lions Gate Entertainment. Both had worked with Hoban on his first feature, BLOOD N’ DONUTS, and they were fans of the Ginger Snaps team and script. Suddenly, the producers were in serious negotiations, once again, for US and foreign sales. The deals closed in less than a month, just making the annual deadline at Telefilm. With the first big hurdle cleared, the team focussed their attentions on the two most crucial creative elements: finding the two leads and sourcing the special effects artist who would design and build the werewolf creature as well as all the transformation elements. Paul Jones was brought on as Prosthetic Effects Supervisor and Creature Designer. The special effects force behind BLADE, BRIDE OF CHUCKY and HELLRAISER II – IV, Jones talks about why he got involved: "There were a couple of offers that came up around the same time I was offered Ginger Snaps, but Ginger Snaps struck me as a film that would show off what I do for a living extremely well. It has everything in it. Every aspect of what I’ve done over the last five years is in this one film: transformed humans, werewolves, dead animals, prosthetic make-up, sculpting and animatronics. And from a story point of view, it struck me as excellent genre story telling. It’s about this young woman who is going through this horrorific transformation, while going through personal hell at the same time. I thought the combination of story and make-up opportunities was great. " Once Jones was hired, he threw himself and his shop into production for there were dozens of prosthetic effects scripted. The most important thing to design, of course, was the creature itself. "I wanted it to be more skin and muscle than fur or hair, " explains Fawcett. "I really wanted to get away from the guy-in-a-fur-suit trap of other werewolf movies; I was going for a skeletal look. I wanted it to be more hellhound than werewolf, actually." Jones hired and flew in artists from London England, fresh off Lucas’ PHANTOM MENACE to sculpt the creature under his supervision while he concentrated on all the other effects with a team of a dozen local Toronto prosthetic artists. "Ours is not a garden variety werewolf," says Fawcett. "It’s not the mythological creature born under the full moon. Rather, it’s treated in Ginger Snaps as a biological infection that grows from the inside out, through the blood stream." Casting Ginger and Brigitte, the two leads, was a six month long search. It was April, 1999 and casting in Los Angeles had already begun. Finding a casting director in Toronto was an entirely different story. Scripts went out to several candidates, but the horror elements of the script - along with its particularly vivid language - generated more than its fair share of reaction. Hall encountered several casting directors – most of whom freely admitted they hadn’t read the complete script - who were offended and declined being interviewed by the production team. Then they found Robin Cook. Noted for such films as FREQUENCY, THE HURRICANE, and ANGEL EYES, Cook loved the script, its dark humour and the risks it took. She jumped on board immediately. Yet the reaction from the casting community was only the tip of the iceberg. This was the spring of the Columbine tragedy, as well as the shootings in Taber, Alberta. Suddenly violent teens and the movies they watched were the hottest discussions of the day. Word of the toxic combination of violence and teens in Ginger Snaps was leaked to the media. A front page article in the Toronto Star made inaccurate claims that Ginger Snaps was a teen slasher film while alluding to the recent tragedies in Columbine and Taber. That article launched an intense frenzy in the Canadian media – one that involved call-in radio shows, print articles and ultimately Telefilm Canada having to publicly defend its funding choices. Ginger Snaps was talked about across the country, both within and outside of the film community, generating the kind of publicity unheard-of for a film still in pre-production in Canada. Casting occurred in Los Angeles, Toronto, Vancouver, New York and, to a smaller degree, Montreal. Emily Perkins and Katharine Isabelle both showed up the same day in Vancouver. Their auditions were taped and sent off to Toronto, where the team was carefully combing through mounds of videotapes. Everyone stopped when Emily and Katharine's tape was shown. It was September by the time Perkins and Isabelle were locked into the roles of Brigitte and Ginger. With production slated to start in three weeks, the search was still on to find the next two supporting leads, bad-boy botanist Sam and the girls’ mother, Pamela. A script went to Mimi Rogers while she was in Toronto producing a movie of her own. Rogers responded quickly and positively to the dark humour and comic relief in the role. Rogers elaborates: "I wanted to play the role [of Pamela] because the script is really clever, really intelligent and very funny. I enjoy any chance I get to do something comedic since that’s not usually the way I’m cast. And Pam is, on the surface, a Mom role, but it’s really more than that. She’s very comedic, very bizarre in her own way, and so I enjoyed that opportunity. John was very open about my interpretation of Pam and pretty much encouraged me to go wherever I might wander." The producers initially wanted the character of Sam to be an American star. Asked for her thoughts on the role, Robin Cook immediately suggested Toronto-based Canadian Kris Lemche, a favorite of hers, for the role. After Lemche’s first audition, Fawcett knew he’d found Sam. Fawcett surrounded himself with a key creative team peppered with friends from childhood, a talented group of people with whom he’d been making films since they were all eight years old. Director of photography Thom Best (QUEER AS FOLK, BOYS CLUB) and operator Sean Jensen, second unit director Grant Harvey and composer Michael Shields have been making Fawcett movies since grade school in Calgary, Alberta. Another Albertan, Production Designer Todd Cherniawsky (INSPECTOR GADGET, ARMAGEDON, SPHERE) was introduced to Fawcett by Karen Walton six years ago. Cherniawsky became a consultant for Fawcett and Walton throughout the development of the script contributing several key visual leitmotifs to the project. Even Fawcett’s wife, Laura Wood Fawcett, served the film as its second assistant director. Production started on October 25, 1999 and was completed six weeks and two days later on December 6. Locations were in the suburbs of Toronto – Etobicoke, Brampton and Scarborough all played as the "mind-numbing suburb of Bailey Downs". The first day at the main neighborhood location was in fact a pre-production day used to shoot stills for the opening credit sequence. This involved staging dozens of gruesome mock suicides outside a suburban home. Drawing a crowd of neighborhood kids and adults, the crew was concerned it might wear out its welcome before the first real day of production. But everyone maintained a sense of humour as countless elaborately-staged deaths were recorded. All low-budget, independent films have tales of hardship. On Ginger Snaps, 16-hour days pushed the start of each production day later and later. The schedule became so off-kilter that by Day 18 the crew was reporting to work at midnight to a greenhouse location for a day scene. The director of photography resorted to completely covering the greenhouse in diffusion gel, then blasting through four 18 k lamps to create the impression of daylight. Approaching the set in the middle of the night, the light could be seen in the sky from more than a mile away. Post production began in December, 1999 with editor Brett Sullivan [HIGHLANDER III ] having only eight weeks to work with Fawcett to shape the film. Equally, sound designer David McCallum and his team at Tattersall Sound had an impossibly short period in which to achieve the sophisticated sound tracks for Ginger Snaps. Brought on in the final five weeks prior to mix was first-time music supervisor Scot McFadyen. Given the nearly impossible task of finding and securing licenses for source music for the film, McFadyen took the task one step further and secured a soundtrack album deal with the hot indie label Roadrunner Records based in New York. As a label that features the new metal sounds which are enjoying a tremendous resurgence in popularity with teens, Roadrunner was a perfect match for the dark, creepy Ginger Snaps. "The werewolf’s impressive European ancestry became focussed in the Christian era’s dark centuries of superstition and witch hunting. The old horror tales of those centuries showed the witches in possession of the shape-shifting power, conferred on them by Satan." Man, Myth and Magic. Emily Perkins is Brigitte Fitzgerald, a 15-year-old late bloomer uncomfortable in her own skin. Devoted to her older sister, Brigitte is willing to risk almost everything to cure Ginger of the monstrous infection that is transforming her into a werewolf. At 22, Perkins is an award-winning veteran of stage and screen. Film performances include PAST PERFECT (Karen Daniels, lead), BROKEN PLEDGES (Suzanne Stevens, lead) and the movies of the week IT (Beverly Marsh, lead) by Stephen King, SMALL SACRIFICES (Karen Downs, lead) with Farrah Fawcett, and IN COLD BLOOD (Kathy Ewalt, PP). Her television appearances include THE X-FILES, MOM P.I., DAVINCI’S INQUEST, THE ODYSSEY and DANGER BAY. She has also appeared in the stage productions of MYTHOLOGICALLY SPEAKING and KID’S RIGHT LEAD. In 1990 Perkins was recognized by YTV with a National Youth Achievement Award in Acting. She has trained with the Company of Rogues, The Vancouver Youth Theatre Company, the Carousel Theatre and the Amadeus Children’s Choir. Katharine Isabelle plays 16-year-old Ginger Fitzgerald, an angry young woman who is discontent with her boring and meaningless life. Everything changes, however, the night she is viciously attacked by a werewolf. Although only 18 years old, Vancouver-based Isabelle is no stranger to film. Her CV already boasts a daunting list of film credits, including DISTURBING BEHAVIOUR (Lindsay, co-lead) and SPOOKY HOUSE (Mona, co-lead). Selected movies of the week include TITANIC (Ophelia, PP) and BURNING BRIDGES (Emily, PP), while Isabelle's television appearances include THE X-FILES, GOOSEBUMPS, LONESOME DOVE, DAVINCI’S INQUEST, MADISON and FIRST WAVE. Mimi Rogers plays Pamela Fitzgerald, the mother of Ginger and Brigitte. Pamela is a throwback to a kinder, gentler time - she is a homemaker who is devoted to her daughters yet completely oblivious to the reality of their lives. A complex woman, Pamela's cheery and slightly flakey demeanour masks an unexpected, fiercely determined edge. An internationally-acclaimed actor, Rogers has appeared in numerous feature films, television movies and episodic television programming. Known for characters such as Claire Gregory in SOMEONE TO WATCH OVER ME, Rogers is also instantly recognizable as Mrs. Kensington in AUSTIN POWERS: INTERNATIONAL MAN OF MYSTERY, Special Agent Diana Fowley on THE X-FILES and Claire in THE MIRROR HAS TWO FACES. In addition to GINGER SNAPS, Rogers will appear in SEVEN GIRLFRIENDS in 2000. "I think what distinguishes Ginger Snaps from other horror films is that, on the surface it’s a genre film a horror film, but the script is much more intelligent than that, much funnier than that. I think the fact that it is layered and multi-dimensional makes it different from most horror films made today which are, kind of, just slasher movies, which I don’t find particularly interesting. Ginger Snaps is a horror film that works very much on a psychological level. And, it’s also in many ways, a black comedy." Mimi Rogers on Ginger Snaps. Kris Lemche is Sam, a bad-boy botanist who helps Brigitte find a cure for the infection overtaking Ginger. Although initially tough and aloof, Sam’s intelligence and vulnerabilities surface as he becomes more deeply involved with the Fitgerald sisters' plight. This Gemini-Award-winning (Canada’s Emmy Awards) actor has amassed an impressive list of credits. Lemche was featured in the role of Noel Dichter in David Cronenberg’s EXISTENZ and appeared as Emile in the 1999 mini-series JOAN OF ARC. Lead roles include ST. JUDE and JOHNNY, two Canadian feature films. Coming out in 2000, Lemche can be seen in Lawrence Bender’s KNOCK AROUND GUYS. Television work includes a recurring role on TWITCH CITY and appearances on LA FEMME NIKITA, EMILY OF NEW MOON, EERIE, INDIANA: THE OTHER DIMENSION, GOOSEBUMPS and TEEN KNIGHT. Lemche's theatre credits include LAUGHTER ON THE 23RD FLOOR, DILATORY RESOLVE and OPENING NIGHT. Lemche won the 1998 Gemini Award for Best Performance by an Actor in a Featured Supporting Role in a Dramatic Series for EMILY OF NEW MOON. Jesse Moss plays Jason, one of the popular kids at school and the target of Ginger's first seduction. Her aggressive desire turns violent and Jason becomes unwittingly infected with Ginger's disease. He soon begins his own monstrous transformation. Moss’s credits include television roles on COLD SQUAD, STARGATE, THE OUTER LIMITS, HONEY, I SHRUNK THE KIDS and ARE YOU AFRAID OF THE DARK. He has also appeared in feature films including INCIDENT AT DECEPTION PASS and GOLD DIGGERS. Moss also has a background in theatre and has done extensive voice-over work. Danielle Hampton is Trina – the object of disdain for the Fitzgerald sisters. Pretty, popular and nasty, Trina drives Brigitte and Ginger to seek their revenge for her mean-spirited taunting. A newcomer to film and television, Hampton is nevertheless an accomplished dancer and choreographer, Hampton has appeared on stage in many theatre productions, including ANGELS/TONGUES (Toronto Fringe Festival), 2 A.M., and COME SAVE TODAY. She was featured in the music video for "Love Song" by Canadian pop sensations Sky. Hampton's acting experience includes appearances on CODE NAME: ETERNITY, CINDERELLA’S REPRIEVE and THE HOOP LIFE. "There are several ways to become a werewolf. They include being given the power of shape shifting through sorcery, being cursed by someone who you have wronged in some way (called the Lycaeonia curse), being bitten by a werewolf, and being born to a werewolf. In each case, the blood becomes tainted or cursed. A person who becomes a werewolf against his will (birth, curse or bite) is not completely damned until he tastes of human blood. Once he does, his soul is eternally damned and nothing may redeem him. Even without tasting of human blood, however, as long as the taint lays upon the immortal soul, it cannot enter Heaven, and will remain chained to the mortal plane upon death...."
A dynamic, talented filmmaker with vision and infectious enthusiasm, John Fawcett’s experience includes feature films, television, music videos and commercials. He also has several award winning short films to his credit, including the festival favorite HALF NELSON. Fawcett made his feature film debut in 1996 with THE BOY'S CLUB, a dark adolescent drama starring Chris Penn (Reservoir Dogs, Short Cuts). Released theatrically by Alliance Communications, Variety called THE BOYS CLUB "an intense, involving drama" and praised Fawcett for investing the film with "a tough realistic sensibility that sets this pic apart from the pack" (May 27/96). THE BOY’S CLUB went on to receive five Genie Award nominations (Canada’s Oscars), including Best Direction, Best Actor (Chris Penn), Best Original Screenplay (Peter Wellington), Best Editing (Susan Maggi) and Best Production Design (Taavo Sooder). THE BOY’S CLUB now enjoys wide video distribution and has been sold to broadcast markets throughout the world. Ginger Snaps is Fawcett’s second feature film. A Canadian creator of fiercely fresh stories, Walton’s toney, often provocative scripts for film, prime-time series and movie-for-television productions have enabled her to work with some of her country’s finest industry talents. A recent poll of television professionals in The Globe & Mail named her one of the "Top 40 Most Influential People in Canadian Television", while The Toronto Star cited her as one of the ‘writers to watch’ in the new millennium. Ginger Snaps is her first produced feature film. Also produced in '99 was Walton's reality-based period movie-for-television HEART: THE MARILYN BELL STORY, which premieres on CBC later this year. Walton’s other television credits include her Gemini-nominated work on the critically-acclaimed youth series, STRAIGHT UP, and the adult prime-time drama series, THE CITY – where in addition to writing in total seven episodes, she served as Executive Story Editor for its second season. Walton holds a B.A.Honors in Drama from the University of Alberta, and is a graduate of the Canadian Film Centre’s Screenwriting Residency and Professional Screenwriting Programmes. Wielding a peculiar mix of life experience from both the Maritimes and the Prairies, she has lived and worked in Toronto since 1994. Steve Hoban began his career as a feature film producer in 1994 with BLOOD & DONUTS. Directed by Holly Dale, BLOOD & DONUTS was the first feature film produced under the auspices of Norman Jewison’s Canadian Film Centre. In 1995 Hoban joined IMAX Corporation, spearheading the creation of their animation studio and the development of proprietary 3D-animation technology. The first glimpse of this new technology was unveiled Christmas 1998 with the international release of PAINT MISBEHAVIN’, an animated 3D short produced by Hoban with IMAX co-founder Roman Kroitor. Currently Hoban is producing the first IMAX 3D computer-generated film CYBERWORLD, which will be released internationally this fall. He is also developing OWLS IN THE FAMILY a feature film based on the Farley Mowat best seller, with a screenplay by Brian Morey. Hoban’s other credits include co-producing two shorts: the critically-acclaimed ELEVATED (written by Karen Walton) and the award-winning HALF NELSON (directed by John Fawcett). Prior to entering the world of film production, Hoban was Vice President, Business Affairs at Motion Picture Guarantors, where he was responsible for the financial and contractual dealings on dozens of television and film productions. During his tenure at MPG, Steve Hoban worked on productions from all over the world with budgets ranging from a few hundred thousand to tens of millions of dollars. Karen Lee Hall worked in film production as an assistant director for 12 years prior to 1992 when she produced three award-winning shorts: PERSONAL EFFECTS (Lori Spring), COLESLAW WAREHOUSE (Bruce McCulloch) and THE FAIRY WHO DIDN’T WANT TO BE A FAIRY ANYMORE (Laurie Lynd), winner of the 1993 Genie for Best Short Film. Currently Hall is in post-production on OUR HERO a 13 x 30 minute comedic series airing on CBC starring Cara Pifko. Created by John May and Suzanne Bolch, OUR HERO is a series featuring a 17 year-old girl named Kale with a most unique take on life. In 1995, Hall completed the theatrical feature HOUSE (also directed by Laurie Lynd), marking her debut as a feature film producer. Based upon Daniel MacIvor's award-winning play of the same name, HOUSE had its world premiere at the 1995 Toronto International Film Festival. It went on to screen at festivals worldwide including the prestigious Sundance Film Festival. HOUSE was released theatrically in 1996 and is currently available on video. Director of Development at Epitome Pictures and Director of Television Development at Paragon Entertainment where she put several series into development including the above-mentioned OUR HERO and the documentary series TAKE FIVE created by Vanessa Coffey and Jim Ballantine (REN & STIMPY, RUGRATS) with CBS. Hall has several properties in development at her production company, Water Pictures as well as at Heroic Film Company that she co-owns with John May and Suzanne Bolch. Thom Best is quickly becoming one of the more respected DOPs in Canadian film. Initially making his mark with music videos, commercials and dramatic shorts, Best has since moved on to feature films. His list of credits includes the films GRIZZLY FALLS, HIDDEN AGENDA, THE BOYS CLUB, 976, MURDER AT THE WAYSIDE and THE INNER VOICE. Best has also worked as a cinematographer on a number of MOWs, including RUN THE WILD FIELDS, ONE HEART BROKEN INTO SONG and SEEDS OF DOUBT. Best is currently in post-production on his own feature THE ICE MEN and will be lensing the Showtime series QUEER AS FOLK in the summer/fall of 2000. Todd Cherniawsky’s many film credits include INSPECTOR GADGET (set designer), ARMAGEDDON (set and industrial designer), SPHERE (set & industrial designer), HIJACKING HOLLYWOOD (production designer) and UBERWOLF (production designer). Cherniawsky attended the American Film Institute where he received a Master of Fine Arts in Production Design. His training also includes a Bachelor of Fine Arts (Art & Design) from the University of Alberta and an Honors Diploma in Architectural Design Technology from the Northern Alberta Institute of Technology. A Gemini-Award winner (Best Picture Editing for PSI FACTOR), Brett Sullivan’s extensive list of credits includes the feature films POCAHANTAS – THE LEGEND, HIGHLANDER III, BLOOD N’ DONUTS and CYBERWORLD, a 3D animated IMAX movie. Sullivan's television work includes TWICE IN A LIFETIME, PSI FACTOR (Seasons I & II), JENNY AND THE QUEEN OF LIGHT, DREAM HOUSE and DOOLEY GARDENS. Sullivan also worked on the short film ELEVATED, which received a Genie nomination and was nominated for Best Editing at the Yorkton Film Festival. Robin Cook is one of the leading Casting Directors in Canada. She has been casting films and television series for fifteen years, most recently on features such as THE HURRICANE (directed by Norman Jewison), FREQUENCY (starring Dennis Quaid), and ANGEL EYES (starring Jennifer Lopez). She has also done extensive work in television, working with director Ken Finkleman on his three television series - FOOLISH HEART, THE NEWROOM, and MORE TEARS. In between she has also found the time to lend her talents and expertise to many independent Canadian productions, CBC television series, and television specials. Paul Jones created the prosthetics for every stage of Ginger’s werewolf transformation. A horror fanatic, Jones established Paul Jones Effects Studio in 1994 and has since created animatronic creatures and special make-up effects for countless television shows including GENE RODDENBERRY’S EARTH: FINAL CONFLICT and F/X: THE SERIES. Jones has also provided make-up effects for the films BRIDE OF CHUCKY, BLADE and THE CORRUPTOR. Prior to 1994 Jones worked with Image Animation in the U.K. Closely involved in HELLRAISER II and HELLRAISER III, Jones created both the "Pinhead" and the "Camera Head" make-ups for HELLRAISER III. Paul Jones was also an Effects Designer on NIGHTBREED before going on to coordinate animatronic effects for HIGHLANDER 2: THE QUICKENING and prosthetic effects for WARLOCK: THE ARMAGEDDON. Lea Carlson has developed her particular style through working on many independent Canadian productions, features as well as television series. Her design credits include acclaimed LAST NIGHT (Don McKellar), HIDDEN AGENDA and JOE’S SO MEAN TO JOSEPHINE with Sarah Polley. Her television work includes THE BOWEN MURDER MYSTERIES, EXTERNAL AFFAIRS, THE NEW GHOSTWRITER SERIES and LIBERTY STREET. Carlson has earned two craft award nominations for her costume designs: in 1998 she received a Gemini Award nomination for the outrageous CBC series TWITCH CITY and in 1994 a Dora Mavor Moore Award nomination for the theatrical production of CLAUDIUS. Mike Shields is a composer/singer/songwriter from Calgary, Alberta. Musically active since the age of five, Shields boasts a diverse musical career since then. He has written and played with a variety of pop and rock bands, released two CD’s of his own songs "Grace Motel" in 1995 and "Stranger Than Fiction" in 1999, and toured with the acapella group GUILD for two years. One of Shields main loves, however, is scoring. As music director at Jet Music, Shields has scored dozens of commercials and television programs. Shields feature film work includes TWO BROTHERS, A GIRL & A GUN and AMERICAN BEER. His television work includes FROM THE HIP and which earned him an IRIS Award, SNOW SAFARI, and RUNNING ON EMPTY. With more than 19 years experience performing and coordinating stunts, Shelley Cook’s body of work is impressive. She has done stunt coordination for a myriad of productions, including TWICE IN A LIFETIME, FLOWERS FOR ALGERNON, PSI FACTOR, ANNE OF GREEN GABLES, TRADERS, ICE and SILENT ECHOES. As a stunt performer, Cook's credit list includes 50 feature films and more than 60 television shows. Shelley Cook also works as a director and an actor.